Racing is at Tamworth and Narromine today. Local trainer Scott Singleton thinks Cyclonite can win on Monday if he starts better after a slow getaway cost him any chance when first-up last month. The Charge Forward three-year-old ran fifth to Captain Courageous at his home track but was less than two lengths off the winner on the line. "I think he's going terrific," Singleton said. "He just missed the kick the other day in a race I thought he would be leading but he was back near last. "It might have been a different result had he jumped well. Missing the start just by a neck meant the gap closed up and he got stuck in behind them." Cyclonite will line up in a Benchmark 70 Handicap (1100m) and drops 3.5kg off his last run. 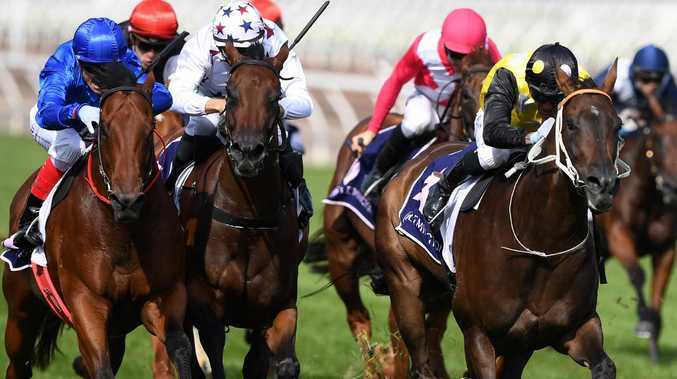 He has already had a win at the track and mixed it with some of the better young horses to date, most notably on Melbourne Cup day behind Legend Of Condor in a race up the straight at Flemington. It has often been bad luck and/or her racing pattern which has kept her a maiden - until now. Should win this with even luck. is too short for him. Was tried in good races in the spring and was a Group 3 runner-up at Newcastle to Aramayo. Will have benefited from his return run at Gosford last month. Has plenty of reasons to smile with a great book at Hawkesbury. Race 4: 1,2,4,6. Race 5: 1,2,3. Race 6: 1. Race 7: 3,4,6,9.
in five starts this campaign. Will be hard to get past here. Impressive winning his two runs this time in. Only has to see out a strong 1200m with his big weight. Winless after 14 starts but he has been runner-up four times and third twice. He may not get a better opportunity than this. Cyclonite needs to get away cleanly and try to lead the field with Christian Reith on board. "He needs to use his speed early," Singleton said. "He's still only a three-year-old and he's not very big. He drops a bit in weight for this run and it's ­probably more suitable for him than carrying the 60kg like he did last start. "He is going well and has always been able to gallop a little bit. When they are two-year-olds it's hard to find races for them, which is why he's had to take on some good horses. "I think he's up to these horses as long as he jumps well and controls it. If that happens, he'll be a big hope. "Christian got off him the other day and said if he had jumped well he would have won." Winch has been through a lot but he's starting to string a few races together after tendon problems kept him off racetracks for two years. They have persisted with him for good reason; he won his maiden by nine lengths at Kempsey. He lines up in a Class 1 Handicap (1300m) and Singleton thinks he will run much better than when third last start at Nowra. Before that, Winch produced an eye-catching third at Kembla Grange. It's common for horses to do that off such a long break then race a little plain at their next start. "I don't think the injuries have taken his talent away," Singleton said. "He's lightly raced and improving a little bit. "He's made his way back and I think his first two runs back have been good for a horse that's had such a long lay-off. "He was probably a little bit flat last start because he was second-up. They often run good first-up after a long break but not always at the next start." Singleton said Winch had thrived on the training track since and should be competitive at his home track, where he runs well. "He has been bright as a button since and I think he'll be competitive,'' he said. "He feels as sound as a bell at the moment and if he runs like he did first-up he'd nearly win." 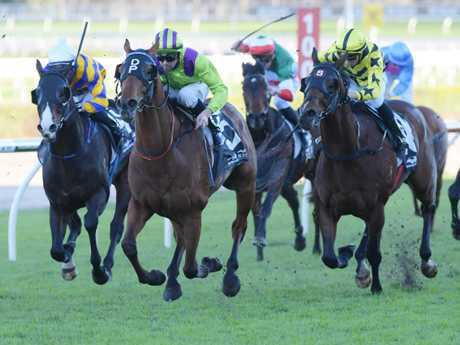 Tamworth and Narromine are the two venues for racing in NSW on Monday afternoon. Expiredtime is yet to finish in the placings in his 16 starts but he gets his big chance now that he steps up to 2100m. Clearly he is not the fastest horse in the world but he does seem to stick on a bit and sometimes in these style of races that is all that's required. Hopefully The horse can box seat from the two alley and has 3kg off for Billy Owen. Brilliant Mind has placed at three of his six outings, the last one was an on-pace second here over 1800m. The Gary Moore trained gelding is by So You think so should stay the trip. Domenica Rose is best of the others given she seems purpose built for this trip. The Jason Coyle-trained mare Cappamore was close enough to a good thing beaten when runner-up to her stablemate at Gosford first-up. It's not the first time her good deeds have gone unrewarded. She is midweek class at her very best, she just needs a good ride to put them away and Jason Collett is the man for the job. Surely it is her day. The Brad Widdup housed Lily Astolat is a Camelot filly who ran a very encouraging race on debut here at home. Every extra inch will assist. Brunetta has raced in races won by Trope and Mizzy at her two tuns this preparation. The best horse to come out of today's meeting going forward is without doubt the handsome Godolphin gelding Pretorius who debuts here. He is so well bred; his 2nd dam is by Seattle Slew, his 3rd is by Secretariat. Whether the 1100m is too short is the only query but he is loaded with quality and potential. Market watch advised. Shadow Ace is a Garry White filly who has sent out the right signals in her trials. Freedom Rock is miles better than her debut when beaten 15-lengths on the Kensington track by Classique Legend. Garry White has a formidable strike-rate at home here at Hawkesbury. Ditto for his underrated gelding Dunatun whose record at the track and distance is three starts for two wins. Indeed, three of his four career wins are at his home track. Always hard to beat here. Phuket likewise excels at this venue. The Allan Denham-trained gelding has won three of four visits and is aiming for a hat-trick this prep. Legistation goes well fresh and is trained here. Could play a role at some sort of odds. Flashy chestnut Vedder will strip fitter for his first-up fourth at Gosford under his big weight. The Team Hawkes trained gelding stretched Roheryon on debut at WF then went to Gosford after that and was a dominant all the way winner. Wide draw is certainly no help to him but he certainly has the class to prevail. Chabreet has been trialling the house down ahead of the return; ran 2nd in a Randwick heat to Ball of Muscle last month. Decor is a major player, so too Valeria. Cloak is a Godolphin trained gelding who was tried in stakes class in the spring and with some success notably his 1-length second to stablemate Aramayo in the G3 Newcastle Spring Stakes. Cloak was a drifter in the market first-up at Gosford and raced like a horse who would be much better next time over a bit more ground. This is that time. Velocano is a better horse than the record of one win from 17 starts suggests. Adonis Victorious is handy but drawn poorly. Tuesday Special is John Singleton owned and bred filly by Snitzel out of his own 4-times Group 1 winner Tuesday Joy. Trained by Bjorn Baker, Tuesday Special got off to the perfect start with an impressive win here in a 1300m maiden on February 21. She has to take that next step to a Class 1 now but she came up with the favourable barrier (2) that should see her get the gun run again. Seewhatshebrings just missed her second up in a 1600m Class 2. Back to a Class 1 now. Uber Lux is a typically consistent Jason Coyle trained mare who can easily figure.